Nov 16 A Lindsey Christmas! Sep 30 Busy Season Begins! Newest Album Released May 2017! Welcome to a little picture of The Lindsey Family! We are a family band featuring Dad, Mom and an ever-changing arrangement of eleven siblings! 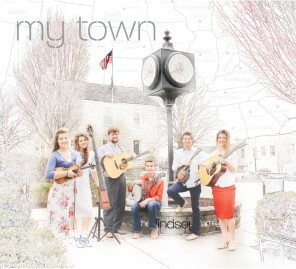 Traveling and playing music throughout the United States and Canada, we sing and play primarily gospel-oriented music, mostly in the acoustic tradition, with other instruments and styles as appropriate. Our repertoire also includes some traditional bluegrass selections and some songs, well...just for fun! Our primary criterion is that our music must be morally pure and uplifting to the hearers. Our vision is to share hope and purpose in a world that has lost its sense of simplicity and family togetherness. Since our understanding of eternal things compels a hope and trust that Jesus is who He says He Is, which naturally drives a message of faithful following after Him, our presentation will follow suit. From having fun and sharing laughs with our audience to feel-good music with a message, most folks enjoy the fact that we're a family united in a purpose—from the littlest to the oldest still at home. Sometimes we even get to enjoy our older children who have gone on to other things taking a night to guest with us at an event here and there. Another of our missions seems to be encouraging folks that music is accessible to everyone. We've helped dads with two-year-olds start with a ukulele, and we've helped 82-year-olds start playing guitar. We use two main vehicles for sending the message: Concerts and "Bluegrass In The Schools" events. At concerts we share with mostly adults how it can be done, and at schools we get to teach and demonstrate it to children. It's possible you might think music isn't for you, but we'll help you get over that. You CAN do it, and we're ready to get you over the hump. You'd be surprised just how close you are! If you're interested in having The Lindsey Family be a part of your festival, fair, convention, executive meeting, homecoming event, school assembly, etc., please drop a line in the contacts page, or give us a call. We always enjoy singing at church gatherings and special events too! Thanks for taking a moment to get to know us and have fun browsing around the website! We'd be happy to meet you too! So be in touch if we can be an encouragement to you or if you would like us to play at your event.